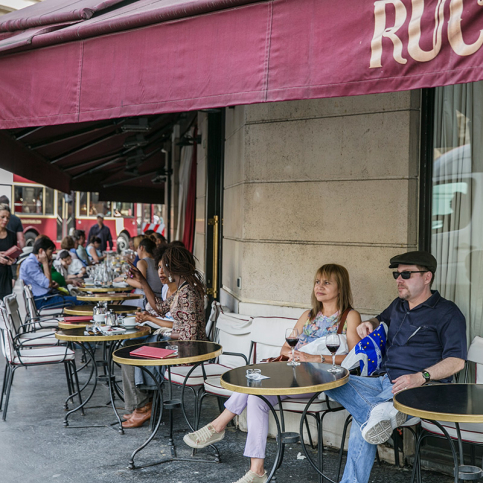 What could be more Parisian than having your morning coffee on the street-side terrace of a traditional café? 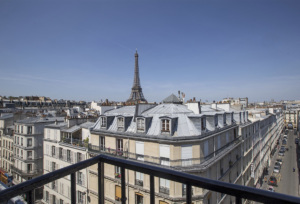 Parisians love being outside, especially when the sun shines, and there are almost numberless restaurants, cafés and bars with terraces to suit every taste. 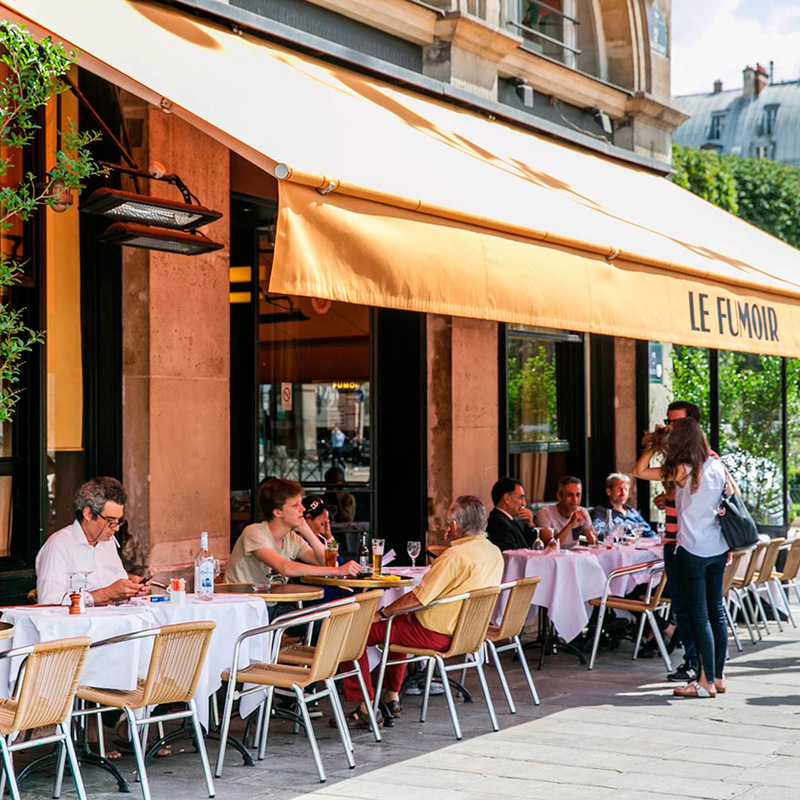 Whether you are looking for a quick espresso, a light lunch, an early evening aperitif with friends, a perfect spot for a first date, a multi-course dinner, or simply some of the world’s best people-watching, Paris’s terraces come in all shapes and sizes. Sunny, shady, covered, small, large, lively, discrete, trendy: you’ll find them all over the city. 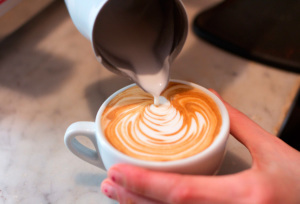 Open: 8 a.m. to 2 a.m. 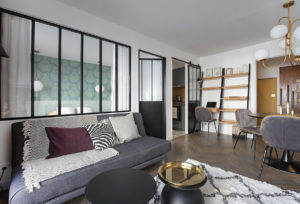 The height of Parisian chic. 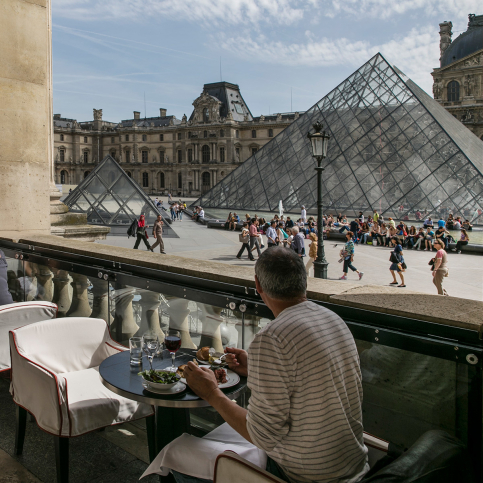 The Café Marly is situated in the arcades of the rue de Rivoli facing the Louvre museum’s famous glass pyramid. 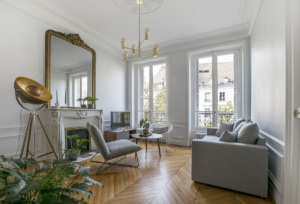 The interior, wood panelled and parquet-floored, is effortlessly elegant, while the equally comfortable terrace is a lesson in casual chic. Inside or out, the food is excellent and, thanks to staff who look like off-duty supermodels, the service impeccable. Why we’ll go back: the location, the comfortable designer chairs, the views. Our recommendations: foie gras (28 euros), le foie de veau aux raisins (29 euros), le bar grillé (35 euros), le diner au champagne, a glass of Veuve Clicquot (17 euros). 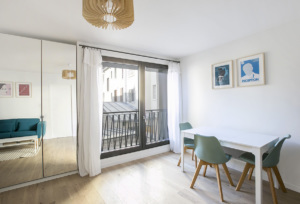 Contemporary style and some of the best views in the city. 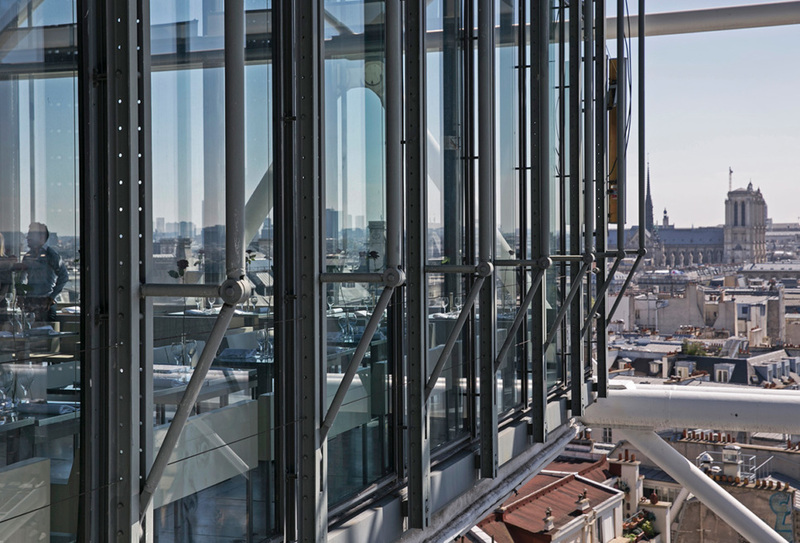 Georges is situated on the top floor of the iconic Pompidou Centre, Paris’s popular museum of modern and contemporary art, and offers extraordinary, uninterrupted views of the city’s lovely rooftops. 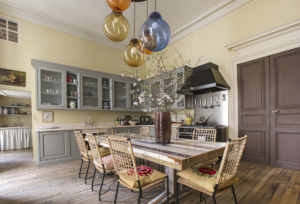 The décor is high industrial chic with lots of chrome but the red rose on every table adds a nice, warm touch. Ask for a table by the windows, either inside or on the outdoor terrace. 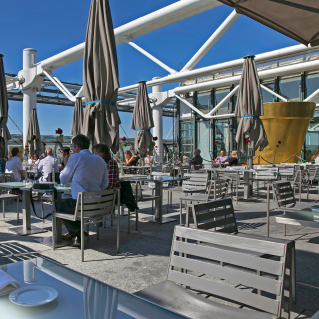 Don’t miss: the panoramic views, the trendy evening crowd and the excellent food. Our recommendations: les raviolis aux champignons, à la crème de truffe (29 euros), le thon à la planche (39 euros), le verre de Bourgogne Côtes de Beaune de J. Drouhin (12 euros). 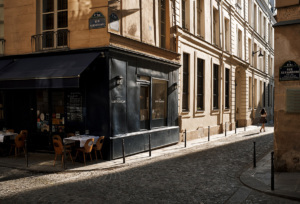 A classic French bistro where Picasso used to eat. 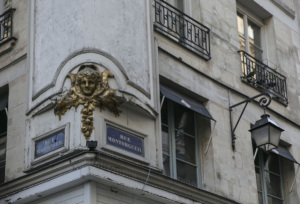 La Rotonde is one of the oldest brasseries in Paris and during the 1920s was a popular meeting place for the many artists living in Montparnasse, Picasso and Modigliani among them. The prices may have changed in the intervening years but the interior is still in the classic brasserie style of red velvet, gilt and tightly packed tables, and the patrons are an interesting mix of local writers, actors and resident Americans. Outside the tables spill out onto the pavement and offer a great spot for people watching. What we like best: the warm welcome, excellent service, and the French equivalent of comfort food. Our recommendations: the fixed price menu at 44 euros, les huitres fines de Claire n°4, l’entrecôte-frites (32 euros), les escargots de Bourgogne, the seafood platter for 25 euros. 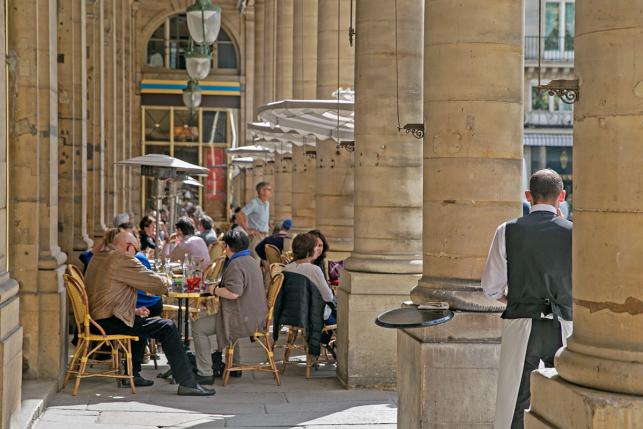 Open: 11 a.m. to 2 a.m.
A pretty and friendly café right by the Louvre. 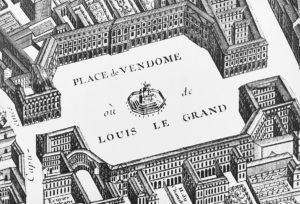 Le Fumoir looks out onto the Colonnade du Louvre, a masterpiece of classical architecture dating from 1670 and built during the reign of Louis XIII. The clientele is a pleasant mix of local residents, young bobos and sophisticated foreign visitors. Soft music adds to the sense of calm and there is a wide range of newspapers and magazines on offer at the bar. 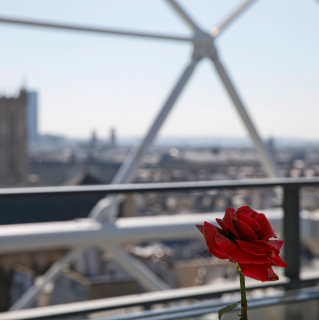 Our tip: Go early to catch the morning sun on the lovely terrace. 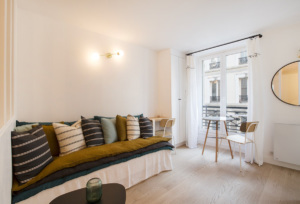 Our recommendations: cheese plate de chez Alleosse (9 euros) with a green salad (7 euros) and a glass of Lalande de Pomerol 2011 (7,90 euros); breakfast with confitures maison; Sunday brunch; and afternoon tea with tarte au citron vert (8,50 euros). A green idyll in the heart of the city. 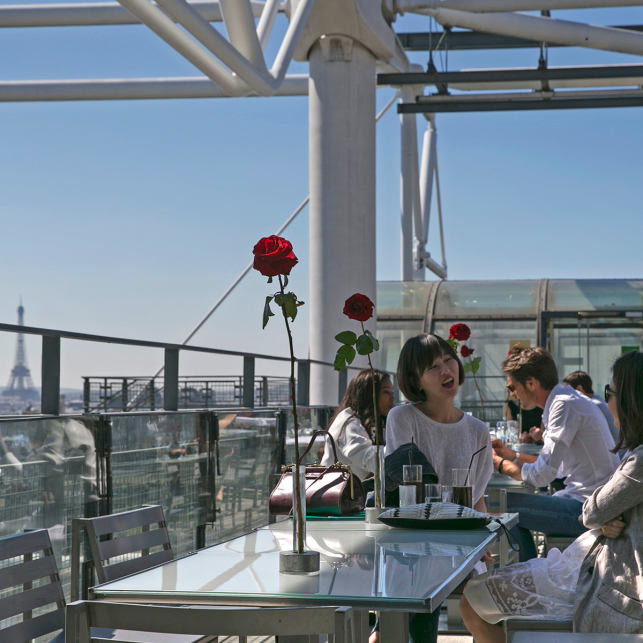 The peaceful terrace of the Café de Pomone in the beautiful Tuileries gardens is the perfect place to sit and enjoy a coffee or glass of fresh orange juice and watch the world go by. In the morning the gardens are full of joggers and hurried businessmen; at lunchtime office workers come to pick up a salad to take away; and after school the terrace is a popular spot for parents and children to enjoy an ice cream. Our recommendation: the house specialty of homemade, orange-flavoured crème brulée. 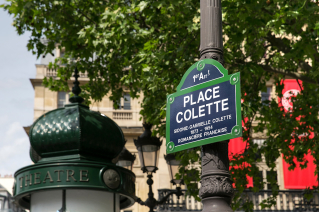 Situated at the junction of the Louvre, the Palais Royal and the Musée des Arts Décoratifs, with a terrace that faces the theatre of the Comédie Française and the majestic Place Colette, Café Ruc is a Paris institution. 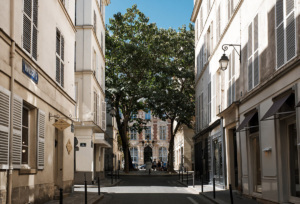 It’s long been popular with an eclectic mix of patrons: foreign tourists, top civil servants from the nearby ministries, actors from the Comédie Française, and the models, designers and glitterati in town for Fashion Week. 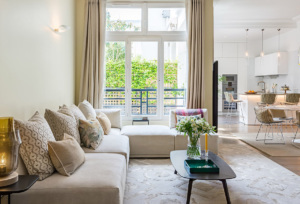 A makeover has given the place a more contemporary look but done nothing to damage its enduring appeal. Our recommendation: if you’re hungry, choose the house cheeseburger or the crab with avocado. 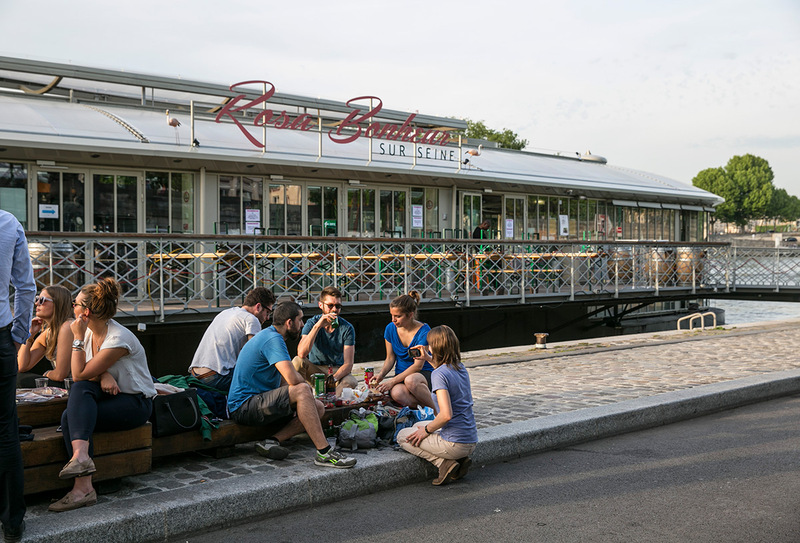 A modern twist on a traditional turn-of-the-century Parisian tavern, the very busy Café Rosa Bonheur comprises a wood and glass boat and a riverside terrace right next to the Pont d’Alexandre on the Left Bank. It’s a great spot for watching a sunset on a summer evening or enjoying a drink while feeling the gentle roll of the Seine under your feet. 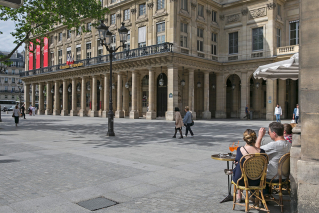 The now pedestrianised quay where Rosa Bonheur is located is also a popular gathering place for young Parisians, some of whom bring their own picnics and sprawl out on deckchairs thoughtfully provided by city hall. Our recommendation: the well-priced wine and a wide and imaginative selection of tapas. 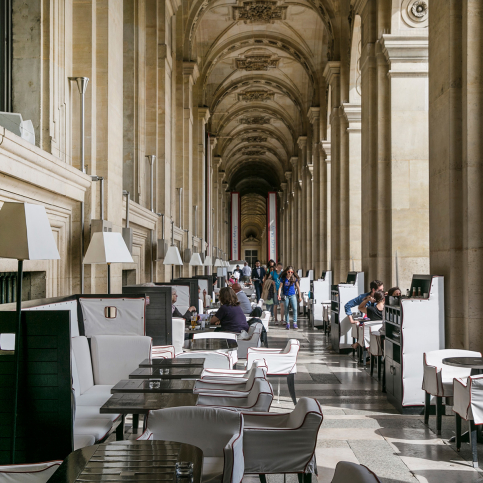 Given its location in the arcades of the Palais Royal, right by the Louvre, the elegant Café le Nemours is the perfect place to take a break from sightseeing. 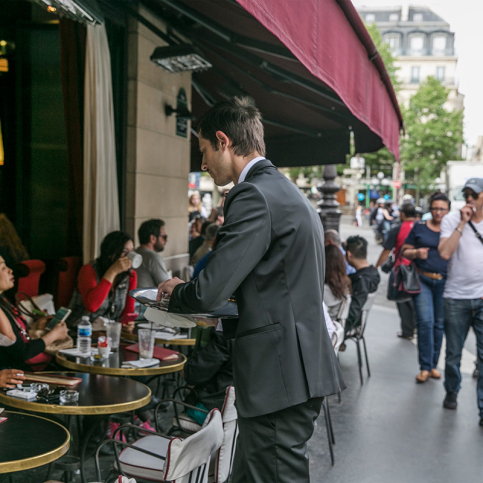 With its cane-backed chairs, round tables, sun umbrellas and traditionally clad waiters, it also presents the classic image of a Parisian street-side café. Heat lamps make for a year-round experience. Our recommendation: when the sun shines, what could be better than a spritz or a well-chilled glass of white wine?